This is my first game review and its only fitting it be my favorite NES Game of all time. The company that produced the game, Square, was facing bankruptcy but luckily the put out this gem. This was my second NES Nintendo game right after the Mario Bros/Duck Hunt combo. I started playing and never looked back. Your goal is a typical rescue the princess type of mission. You start out by creating your party choosing from the Fighter, Thief, Black Belt, Red Mage, White Mage and Black Mage. You can pick any combination of these six to form a party of 1-4 players. There is a good amount of debate on the best four character party but all have their pros and cons. After you form your party you head out in search of the 4 orbs which allows you entrance to the final battle. The four orbs are protected by Lich(Earth), Kary(Fire), Kraken (Water) and Tiamat (Air). On the way to the final battle with Chaos you will go through dungeons, forests, castles and caves while battling orgres, wolves, imps, pirates and more. You also get to travel by foot, ship, airship and even a canoe, now this is pretty epic stuff right here. The classic lining up of the four characters on the right spawned forth a standard that would be seen in many future RPG’s. Choosing parties is one of the huge highlights in this game. Everyone seems to have a different favorite party and it’s always fun to hear the next one. Typically you want a good mixture of melee and magic so you will see a lot of fighter, x, x mage, x mage. This is a standard in the game and a lot of parties follow it. Eventually though you get bored and want to try some unique parties (red mage, red mage, black mage, black mage comes to mind). I personally have probably done 20 or so run throughs of the game over the years and have a few of my own favorites. STRENGTHS – Good diversity, two magic users and two decent attackers (especially towards the end game). Money will only be needed for spells mostly as the fighter will be using found weapons/armor and the black belt doesn’t use weapons/armor. WEAKNESSES – Quite a few of your found items will go to waste as the Knight is the one who equips them. Funding in the beginning is a little tough for all the spells but that will soon not be a problem. STRENGTHS – This party will tear a hole through anything it encounters. A very heavy hitting squad with a touch of necessary magic. Four silver swords in the beginning with turn these guys into tanks. Once you get later in the game all the items you find will not go to waste as the Knight can equip most. WEAKNESSES – Low diversity and no level 8 magic are the downsides of this party. 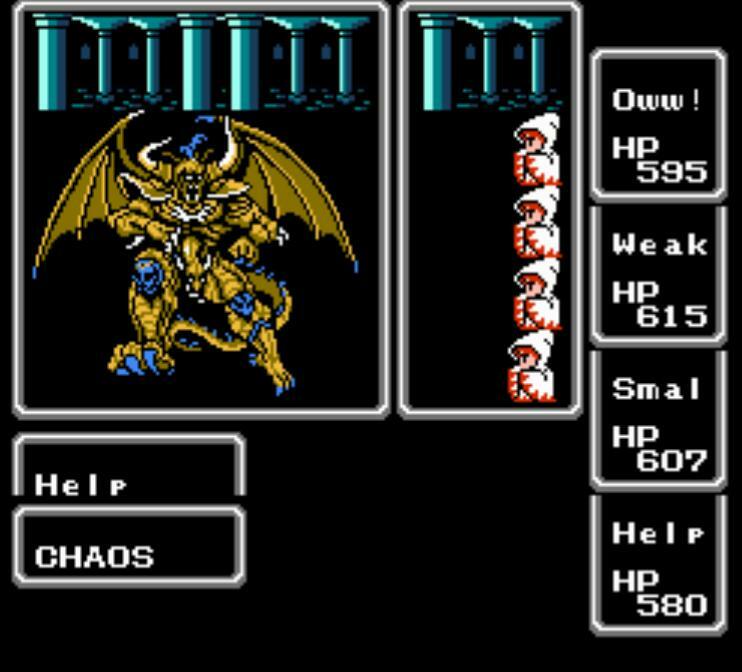 The hardest part of playing this party is not falling asleep before you defeat Chaos. One way to kill the monotony is to use all the items you will find along the way. STRENGTHS – This party is a magic users dream. The Reds do a decent amount of damage with the silver sword if you need melee attacks. The party offers a fun challenge and is one of my personal favorites. WEAKNESSES – Good lord this party is expensive. Once you get into the Earth Cave area your low absorb starts showing also. The Red Mages peak very quickly and it can be a tough challenge for a while. Beyond the diversity of the party creation is the game itself. There are quite a few different routes you can take to win this game, whether you want to do a speed run through (which can take less than 2 hours) or take your time and get all the items that can be found. I would definitely recommend adding this game to your NES Nintendo or ROM collection. The replay factor is huge and this truly is one of the games really helped launch many other RPG’s. I have compiled a few helpful links in case you pick up this classic and want to give it a try. IGN walk-through – This IGN sponsored walk through is a great guide into where everything in the game is. The guide shows a few different routes you can take to win. Hints, Tips and Tricks – This page shows a lot of the hidden unknown things about Final Fantasy for NES Nintendo. Final Fantasy Dedicated Website – This website encompasses everything final fantasy from the first to the last. A great informational site to answer your quick questions.